Have your photos printed on wood for a stunning piece of wall art for your home. Using the finest birch plywood, the wood print plaque is an innovative way to capture a special memory and let it live on. Your design is printed onto its own unique block of wood, and the natural grain texture and ridges come through giving a gorgeous rustic finish. Our bespoke wood prints look gorgeous customised with your photos or artwork. A creative take on the ordinary photo canvas, these have a vintage, rustic, authentic look and feel, created by the natural wood grain, and ridges coming through to the surface. We have five sizes; two square and three rectangular. Our large 30 cm x 30 cm square wood print can be wall mounted, whilst the others are freestanding, ideal for the office desk, side table or mantelpiece. Personalised wood art prints make an original gift set for a loved one. Excellent service and quality, easy to upload and review pics... great valentines gift, just waiting to see if the other half loves it as much as I do ! I ordered a print of my new born son in n wood. I had not heard of this before so was really interested to see what the quality was like. I was not disappointed, very good quality print and the service was very good. Arrived delivered within the week. I would definitely use bagsoflove again. This item is beautiful, love the quality of the wood, with some grain evident, but not too much. It arrived in good time and was packaged well to ensure no damage. Thank you! Ordered a photo print on to a wooden block and very pleased with the outcome! Chose to send a black and white photo and it looks very well done- the picture blends in to the wood and looks very stylish-would definitely recommend! Landscape, portrait or square. We print on wood 24 mm thick to give a 3D effect. Care: Your print can be dusted with a lint-free cloth or cleaned with a damp cloth if necessary. We recommend keeping your wood print out of direct sunlight, to ensure the quality is preserved. A 10 mm hole is drilled in the back of the 30 cm x 30 cm large square, which fits the supplied screw fitting to hang on your wall. A raw plug is also provided. The wood print is fairly heavy, so ensure the screw is firmly seated in your wall. Your image is printed with no white ink used, so any light or white areas will allow the wood colour to show through. If you print a black and white photo the result will be a sepia-toned image. Our digital printing process actually penetrates the ink into the surface of the wood blocks, so that a bond is created. As the wood takes on the ink, colours are given a naturalistic and slightly rustic finish, which will make your artwork or photos truly standout. Every piece is unique with an individual grain and ridge pattern, like a fingerprint. We cannot offer specific pieces per customer, but will always try to choose a piece that compliments your image. Our inks are not opaque so the grain and any natural patterns in the wood will show through your image. Best results are obtained by choosing lighter images with areas of sky or little detail. Large areas of dark colours may not look as vibrant. This amazing 30 x 30 printed timber board is a stunning way to showcase your photography and makes for an amazing gift for your friends and family that they will just love. You can use a single image, or create an amazing collage using one of our shaped pre-set templates, or by starting your own from scratch. 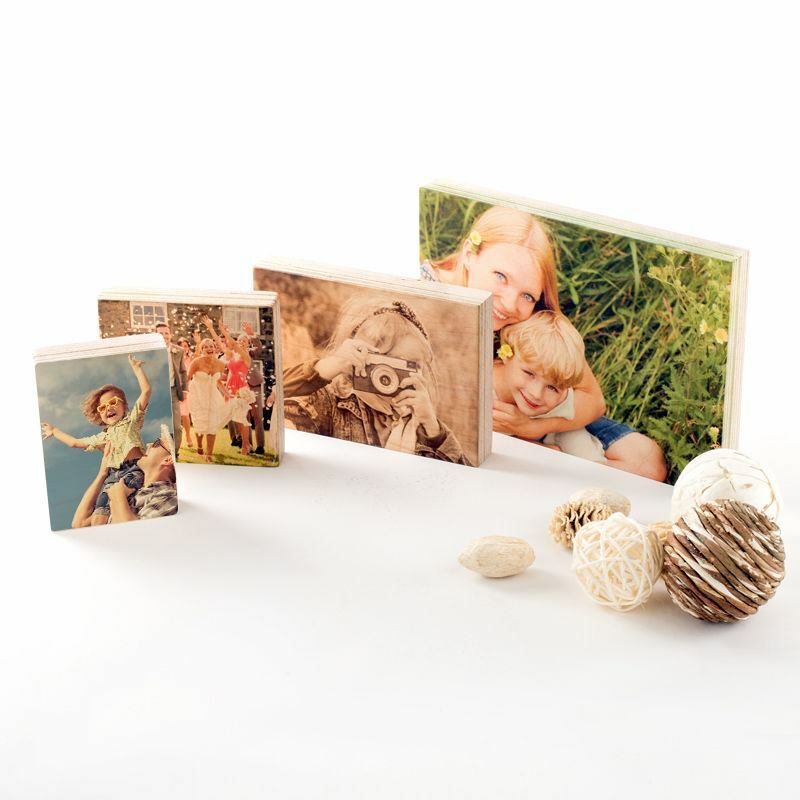 Simplistic yet utterly stylish, photos printed on wood UK are a timeless home furnishing that won't shatter, break or rub off. To commemorate your niece's, nephew's or Godchild's Christening, a photo print on wood is a charming gift. Keep it sentimental with a personalised quote that they can look back on in years to come.